Recently I learned everything I know about Huawei. Ok, maybe a slight exaggeration, but not by much. Huawei thrives just off my radar. Their UC products are not available in the US, and they don’t exhibit at many US events. To learn what I learned, I traveled to China – to Huawei’s annual Global Analyst Summit. It’s actually an annual event, but this is the first time I opted to attend and I’m glad I did. You can download a free TalkingPointz 2Pager on Huawei here. A big thanks to Huawei for making the trip so worth while. It was actually two trips – the first was to Shenzhen for the actual summit – a huge event with something like 200 analysts from around the globe in attendance. Unfortunately, UC was barely uttered at this event. Afterwards several of us took a supplemental trip to Hangzhou for UC focused sessions at the UCC OpenLab. It takes six days for Chinese food to lose its charm. Everything in China is BIG. I left China with conflicting thoughts on Huawei. First off one must respect the growth this company is experiencing. We don’t see 35% growth in many product companies – especially in UC and never in companies of this size. Though a lot of that growth is outside UC. 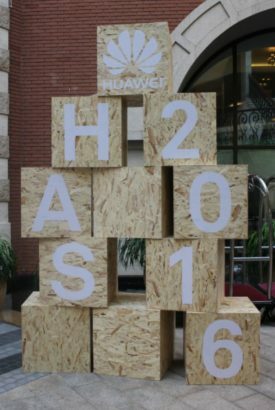 Huawei is booming largely because of mobility – LTE and smartphones. The UC (and video) portfolio was impressive and broad. However, I have three concerns. The UC industry is on a collision path with workstream messaging. I’m not alone with this conclusion, several UC companies are scrambling to ensure messaging becomes central to their portfolio – including Cisco, Unify, RingCentral, and Mitel. In the US these companies are trying to educate the public on the value of the messaging.Huawei does not have a workstream messaging app at this time. WeChat is the dominant consumer messaging application in China. There is no US equivalent in share or functionality. The Chinese understand, even lead the US, in the value of messaging. It’s so successful that I wonder if Huawei or any company will be able to create an enterprise version in China. Eveb worse WeChat’s parent, Tencent, has recently introduced an enterprise version of WeChat. The second concern is video. Huawei spoke a lot about video and is expanding the portfolio. This part makes sense. The concern is Vidyo seems to be winning in their market. In the past few weeks, Vidyo has announced major deals with Alibaba and Xiaomi. – two Chinese giants. I am wondering what’s wrong with Huawei’s video portfolio if it isn’t winning these deals (and what is powering Vidyo’s wins). My third concern is Alcatel-Lucent Enterprise. It’s easy for the us to say that of course Huawei does well in China because it’s a Chinese company. Certainly there’s evidence of geo-favoritism: Ericsson did well in Sweden (and Europe), Nortel did well in Canada, and NEC does well in Japan. Alcatel-Lucent is now a Chinese company, and even better it has western technology. Based on what I saw in Chinese retailers – the Chinese love western brands. ALE isn’t grabbing market share in China like Huawei yet, but I wonder if that will change.